This creamy classic is a satisfying side dish that goes with just about anything, and comes together with only a few minutes of prep work. 2. Butter an 8 inch square baking dish and set aside. 3. In a medium saucepan over high heat, combine the milk, butter, cornmeal, salt, and pepper. Allow the mixture to come to a boil and cook, whisking constantly, until it’s thick (about 3-5 minutes). 4. Transfer the cornmeal mixture to a large mixing bowl. Stir in the corn kernels, green onions, yogurt, and baking powder. 5. Add the beaten eggs and mix thoroughly. 6. 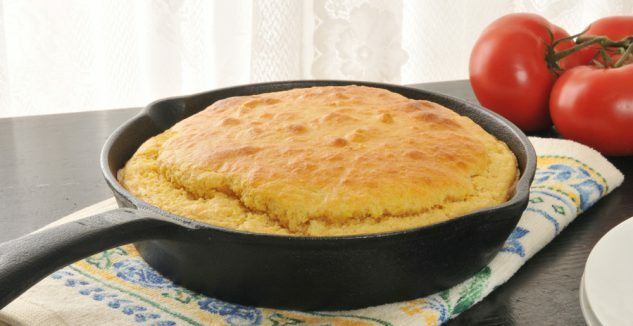 Pour the batter into the prepared baking dish and bake at 400 degrees for 40-50 minutes, until the spoonbread is golden brown and puffed and a toothpick inserted in the center comes out mostly clean. Let the spoonbread cool slightly before serving.